What Color Were Tomatoes Before All the Dinosaurs Died? New research published in Nature suggests that the very same meteor that crashed into Earth 60 - 70 million years ago—the one responsible for wiping out all the dinosaurs—may also be responsible for the red color of today's tomatoes. Parsing Nature's tomato genome analysis, PhysOrg reports that about the same time as the meteorite crash and the solar eclipse, the distant ancestor of the tomato plant tripled in size—an drastic and important response, as it is indicative of stressful growth conditions for plant life at that time. The ancestor tomato, explains Rene Klein Lankhorst, "reacted by expanding its genome considerably in order to increase its chances of survival." 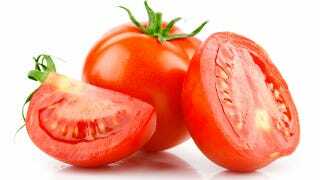 When conditions on Earth improved again, explains PhysOrg, this ancestor of the plant got rid of a lot of genetic ballast, "but the genetic base for fruit formation had already been developed," including the tomato's signature red hue.